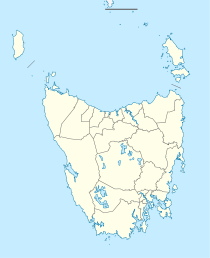 Claremont is a suburb of the City of Glenorchy, part of the greater Hobart area, Tasmania, Australia. It is named after Claremont House, which was built in the 1830s by local settler Henry Bilton, who named it after one of the royal homes of England. Claremont was the home of an Army training facility during World War I, but this was moved to Brighton some time before World War II. At that time Claremont consisted of only a few houses and farms. Between the 1960s and the 1980s, public housing was built in the suburb (as happened in the rest of the City of Glenorchy). Claremont has a senior secondary college (Claremont College which also has a TAFE campus), two government primary schools (Windemere Primary School and Austins Ferry Primary School), and one private primary school (Holy Rosary School). Claremont has a shopping centre named Claremont Plaza, and several churches. Claremont is home to a Retained Volunteer Fire Station whose members support career staff from Glenorchy Fire Station with fire incidents within the area. Sports teams include the Claremont Football Club, an Australian rules football team which plays in the Southern Football League, and Metro Claremont, a football (soccer) team which plays in the Southern Premier League. Claremont is also home to the Mount Faulkner Scout Group and the Claremont Guide Group. ^ Australian Bureau of Statistics (27 June 2017). "Claremont (Tas.) (State Suburb)". 2016 Census QuickStats. Retrieved 5 March 2018. ^ History of Claremont House, Claremont House, 2012. ^ New Schools in Claremont Archived 21 March 2012 at the Wayback Machine, Tasmanian Department of Education, 2010.